This entry was posted in Uncategorized on March 6, 2017 by wasatch. Class size is limited so sign up early to assure your spot! 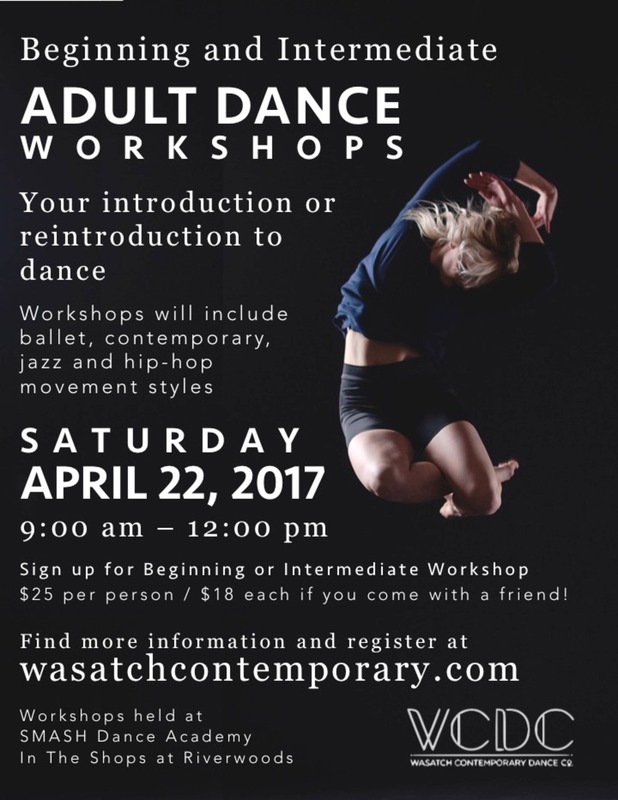 All classes will be taught by professional dancers of the Wasatch Contemporary Dance Company. Come try a “taster” of 4 different kinds of popular dance forms. No prior dance experience required. This workshop is designed for dancers who have taken at least beginning and intermediate classes in the past. Also a great refresher course for advanced dancers who have taken some time off. Dress code: Please wear clothing that allows for movement. No special shoes required. You may dance barefoot or in socks. Tennis shoes recommended for hip hop. No jeans. Dance is a vigorous physical activity. Please modify any exercise as you need for your body. As always, consult your physician before beginning any exercise program.